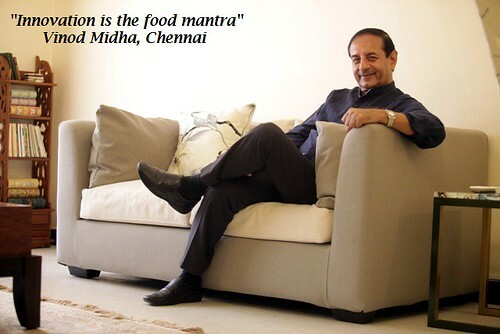 ‘Everything with a twist’ is the mantra with which Vinod Midha enjoys cooking as well as eating. No dish is ever cooked the same way, even dal and sabzi are cooked with a twist- if not the ingredients, then the presentation must be innovative. When he is not at office marketing medical devices, this 65 year-old Punjabi from Chennai is engrossed in the kitchen. 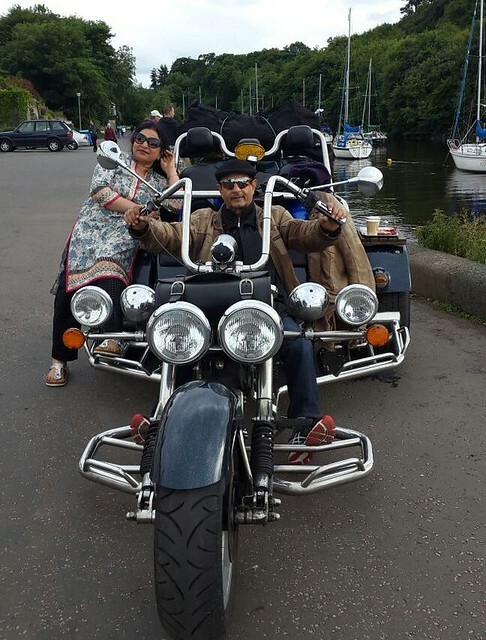 His wife, Seema, is equally passionate and they have collected the most unique ingredients, crockery and gadgets over decades. Meeting them in their beautifully kept home in Chennai, I was amazed at their endless culinary creativity. Namaste Vinodji. To begin with, tell me about your growing years. My father was in the Railways, so we travelled between Gorakhpur, Mussoorie and Jaipur. Most of my schooling happened in these places and then I did my B.Tech from Sindri near Dhanbad. When did you move to Chennai? Almost 40 years ago, two years before I married Seema. We’ve been here ever since. What brought about this deep interest you have in cooking? I have heard so much about it from your cousin and my neighbour Sulakshanaji. During college times, I was living in a hostel and eating at the mess. I often wished the food was tastier or had more variety. I spent my mealtimes with four other friends. The five of us decided to take matters into our hands and started cooking in the mess once in a while. Wow! And the cook did not mind it? Oh, he was more than happy to take a break. And then? Did the passion just continue? Yes. We experimented a lot and tried things on our own, churning out tasty innovative dishes. Do all of you continue to cook even now? What kind of dishes do you like to cook? Anything different. Not the regular ‘ghar ka khaana’. I like to innovate and experiment. Both of us – Seema and I – like to do that. And now it seems the kids have taken over. And where does the inspiration for this come from? Oh, inspiration comes from many things: ingredients, vegetables, kitchen gadgets, street foods and restaurants. Seema (wife): I am sure we have more kitchen gadgets than you can imagine. Wherever we travel to, we keep looking for them. And is the purchase always a success? She: Most of the time, yes. But once in a while, it flops. But it does not deter us! He: Everyone in our circle knows we are foodies, and that we love cooking and eating. When any new restaurant opens in town, we are the first to dine there. Even in the ones where we dine regularly, we try new dishes each time. No paneer butter masala or dal makhani for us. In fact, we don’t even have any favourite restaurants, we only have favourite dishes. She: So much so, that when we make a dish and someone asks us for the recipe, we tell them that there is no recipe. Next time you come and we make this dish, it will never be the same. So you don’t follow recipes? Oh no, we don’t. In fact, both our daughters love cooking, and they’ve taken after us. They don’t follow any recipes either. They also love trying out new dishes. Tell me about your daily menu. What is it like? He: For breakfast, we have sprouts, a salad and mostly a fresh fruit juice. Lunch is like a typical meal in any Punjabi house, but always with a twist. Dinner is again some other concoction, always something new. She: But honestly, even if we make Chila for breakfast, we tweak it with something different each time. He: For instance, have you ever had idli waffles? I make toasted idli, but waffles with idli batter! Would it be sweet? No, but it is very tasty. In the batter, we add some chilli flakes, coriander leaves, curry leaves and ginger. We pour this batter in the waffle iron and out come crispy waffles. I must try this sometime. So tell me, do you both also go to grocery stores often? All the time! We love looking for new things. I guess we love spending time on that. During our travels too, no clothes and fashion shops for us. It is kitchen items and more kitchen items. New moulds, new devices, new gadgets and new cutlery. Look in our pantry and you will find so many kinds of edible decorators and fancy dessert glasses. What about healthy eating? Your culinary experiments must be rich in calories. She: When the children were young, I would cook traditional meals that I used to consider healthy, but Vinod always interfered, adding something or the other to the prepared dish. I tried stopping him, but no luck. Then at one stage, I gave up. I stopped cooking turai or bhindi or gobi. But then, the children got health conscious. He: I think children, and most people for that matter, get bored with routine food. So we have to re-condition the dishes. Re-condition? That is an interesting word. Surely yes. Ask Seema for the recipe of her ‘gatte ki sabzi’. Even a Rajasthani would be taken aback by how tasty it is. Wow, since I am a Rajasthani, I have to ask you for the recipe. Come on, share the secret with me! She: Nothing much. All I do is roast and pound saunf, coriander seeds, ajwain, ginger and even kasoori methi. Add it to the gram flour and see the difference. Another must-try for me! So Vinodji, what is the most important thing in cooking? Presentation –I think this is very important. The first thing is eye appeal, then aroma, then flavour and taste. I don’t think you need lots of masala to cook well. You should have an urge to try, to experiment and to keep at it. Planning is important; we always plan in advance. For instance, if we are having a party, we will plan on how much ice cubes we may require based on the size of the party, so we keep collecting ice from the ice tray in carry bags. Also one must have a penchant for perfection. If I am making a cucumber salad, I like the chopped chunks to look identical and prefer to set aside the smaller bits from the ends for some other dish. Apart from cooking, what are your other hobbies? I volunteer at a local school for underprivileged children. I take classes on personality development, behaviour, etiquette, basic yoga, and communication skills in English. This is a Corporation School here in Chennai. The parents of these children are masons, maids, waiters in restaurants or coolies. When they come up to me, they simply shed tears of gratitude that there is someone who actually cares for their children and is educating them. All this is done under the banner of the Rotary club of Guindy. This is truly moving! I am so glad you shared this. Thank you. But I must also show you Seema’s international garden. 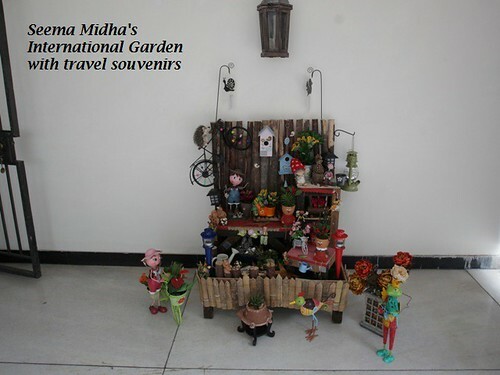 We have built a small structure in which we have arranged all the souvenirs we have picked up during our travels. We love pottering with it. What an innovative idea? Before we move on, what dish would you like to share with me? A sundae. We enjoy making sundaes and have experimented with them extensively over the years. What is special about a sundae is that you can play with the colours and always find something in the kitchen to add a special and unique touch to it. It’s a hit with everyone- the children love it, our family and friends love it, and so do we both. First published in October 2015 in Harmony – the Indian magazine for silvers for the column – ‘His Ladle Love’. A series about men who experience the joy of cooking and can weild a deft ladle in the kitchen. Part-2 of this post is the recipe of Magnificient sundae, a dessert of aesthetic perfection.